Hotel's basement to include ornate wine cellar, with a dining table for special dinners. Sprawled across tables in a room at the former rectory of the Bethesda Episcopal Church were hundreds of samples of just about anything one could expect to find in a hotel room—from ice buckets to shoehorns to cork screws. For much of the winter, staff from the Adelphi Hospitality Group meticulously poured through the samples to find ones that would best fit the guest experience they envision for the historic hotel a block away on Broadway. Even before work crews could finish the hotel’s drywall, they had constructed—and periodically deconstructed—a fully-furnished showcase suite, so that the company’s management could finely hone the finished product that guests will see when the iconic boutique hotel opens on July 1. “We’d build it, live with the room for a little bit, rip it apart and then build it again,” said Toby Milde, president of Richbell Capital, which started the monumental renovation of the 140-year-old structure nearly four years ago. The idea was to get a feel for how each element of the Adelphi’s 32 suites would work with others to enhance the experience of staying at the hotel. The result of this diligence is a hotel that uniquely blends modern era comforts with an atmosphere heavily influenced by the city’s Victorian heritage. The renovated Adelphi set to open on July 1 will blend modern-era comforts with an atmosphere influenced by the hotel’s Victorian heritage. And that’s because the Adelphi will be marketed internationally as a destination hotel—a place that is as unique as Saratoga Springs itself. Milde isn’t looking to compete with the city’s other modern hotels, as much as he is aiming to establish a completely distinct business that immerses his guests in the splendor that was a hallmark of the Spa City’s grand hotels. “We’re really getting into the details, going through hundreds of options to find the best quality and what represents the Adelphi,” he said. The hotel lobby includes a bar named Morrissey’s in tribute to John Morrissey, the former prize fighter and state senator credited with establishing the Saratoga Race Course, who became a fixture at the Adelphi during its first year of operation and later died there. The lobby empties into a sprawling ball room that will seat 186 people for dining and more than 250 people for receptions. The hotel lobby will include a bar named Morrissey’s in tribute to John Morrissey, the former prize fighter and state senator credited with establishing the Saratoga Race Course, who became a fixture at the Adelphi during its first year of operation and later died there.Interior design by Glen & Company Architecture; renovation design by Dominick Ranieri Architect, Schenectady. Off the ballroom is a 1,200-square-foot glass conservatory, which was fabricated in England and will open into the Adelphi’s courtyard garden area. The conservatory will house 60 seats for the Blue Hen, a fine-dining restaurant whose name pays homage to a tavern that once existed on the site where the Adelphi now stands. “It’s going to be very stunning in there,” Milde said. 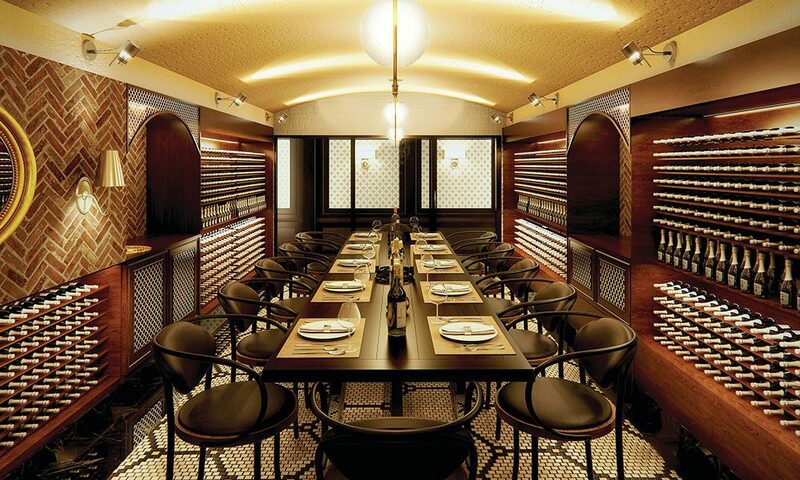 The basement includes an ornate wine cellar, with a dining table for special dinners. A state-of-the-art kitchen to the left of the entrance will serve the Blue Hen, which will also feature about 40 seats for dining in the courtyard. Workers meticulously restored the Adelphi’s original grand staircase, which leads up to a second-floor library that bisects two of the hotel’s larger suites. The library opens into the Adelphi’s rolling piazza overlooking Broadway, a feature that will be open to all guests, as it was before the renovations began. Toby Milde, president of Richbell Capital, talks to Justin Mason of Saratoga Living on the Adelphi piazza overlooking Broadway, which will be a sought-after location for meetings and parties. “The second-floor porch or balcony overlooking Broadway is breathtaking and may become one of the most sought after locations for small meetings, parties and entertaining,” remarked Todd Shimkus, president of the Saratoga County Chamber of Commerce, after taking a recent tour of the renovations. Richbell spared no expense with the hotel suites, which each feature heated bathroom floors, custom-made cabinets and panel-activated lighting. The modern amenities of the rooms are adeptly blended with decor one would expect to encounter at the finest hotels of the Victorian era. The rooms still have the original windows, including some that feature hand-blown glass characteristic of the late 19th century. But all have been lined with interior panes, which essentially eliminate street-level noise from Broadway and the surrounding area. The hotel renovation is only the beginning of the ambitious plan that Richbell has in store for the area around the Adelphi. The company is now in the design phase to construct a 10,000-square-foot health and wellness spa behind the hotel and adjacent to the rectory. Richbell Capital started the major renovation of the 140-year-old structure nearly four years ago. The spa will feature Dorset marble, Vichy showers, and an indoor pool. Plans also include additional rooms that will provide additional guest space for the Adelphi. Further down Washington Street, the company will convert the first floor of the Bethesda Episcopal Church’s former parish hall into a commissary kitchen to serve banquets at the Adelphi. The second floor of the building will house Richbell’s corporate offices; once completed, the complex is expected to employ roughly 250 workers. “We’re bringing a lot of jobs here to downtown Saratoga,” Milde said. At an estimated $34 million, the project is expected to bring renewed vigor into the iconic hotel, which was originally built by Rensselaer and Saratoga Railroad conductor William McCaffrey in 1877. The four-story, 80-room Adelphi was designed in the same style as the city’s other behemoth hotels in the city. Though not considered the most opulent or popular of the city’s lodgings, the Adelphi was classy enough to draw some of the city’s most famous visitors of the day. Aside from Morrissey, the hotel attracted American industrialist Cornelius Vanderbilt, famed Jewish mobster Meyer Lansky, jazz legend Duke Ellington and singer Frank Sinatra, among others. The Adelphi’s smaller size helped preserve it during the city’s protracted economic downturn during the mid-20th century, when nearly all of the grand hotels became victim to the wrecking ball. But the city’s woes eventually caught up with the business, and the hotel was shuttered in the early 1970s. The building became exposed to the elements and was facing demolition when Sheila Parkert and Gregg Siefker rescued the property in 1978. The couple gradually restored each room of the hotel, which became a cherished destination for tourists and city residents alike. The lobby bar was a favorite stop for members of the New York City Ballet following their performances at Saratoga Performing Arts Center. And the courtyard garden became a popular refuge for residents looking to escape the bustle of the summer racing season. But the Adelphi’s renaissance did little to change its gradually worsening structural issues. The hollow box columns supporting the roof over the Broadway piazza were badly deteriorated, leaving the lip of the roof and its ornate woodwork hovering precariously over the hotel’s entrance. More than a century of patchwork projects had left the building’s original king trusses—massive load-bearing beams running diagonally on the second floor to support the two stories above and the open floor plan for the ground level below—seriously compromised. The fixtures were dated, doors sometimes didn’t shut properly and the floors weren’t level. The renovation entailed hydraulically lifting the building on top of a two-story steel superstructure constructed in the basement. Crews also inserted steel beams into the box columns to stabilize the roof over the piazza. Toby Milde in the doorway to the second-floor piazza. The suite to the right is named for racetrack founder John Morrissey, who spent his final days there. The painstaking restoration work was also done in full compliance with preservationists. With roughly 40 percent of the project cost covered by state and federal tax credits, Richbell was obligated to follow strict guidelines to ensure the changes being made to the building were historically accurate. The massive scope of the renovation, coupled with an expanded vision for the resulting business, has drawn out the timetable to reopen the hotel well beyond what the company initially envisioned when it purchased the building in 2012. And that has only augmented the buzz surrounding the project, explained Todd Garofano, president of the Saratoga Convention and Tourism Bureau. Shimkus agreed, saying locals and visitors alike have been asking when the Adelphi project will be finished. Mayor Joanne Yepsen said the restoration of the Adelphi—one of the last remaining Victorian-era hotels—represents a crucial reinvestment in the city’s historic fabric that takes into account both preservation and the consumer demand for modern lodging. She said the renovations, coupled with the surrounding developments, will make the Adelphi a world class boutique hotel that attracts international visitors. Milde said he’s constantly fielding calls about when the hotel will be open for business. Adelphi Hospitality has even booked weddings and events for the coming year. And that’s why Milde views the end of the hotel renovation as only the start of his endeavor, rather than a conclusion. In the coming months, Adelphi Hospitality will begin building a reputation that Milde hopes will make it an international destination and bring business that preserves the legacy of the hotel long into the future.